Green Buildings are a subset of Sustainable Buildings. Hence, a green building may not necessarily be a sustainable building. As per the three pillars of sustainable development, the challenge is to reach social sustainability, economic sustainability and environmental sustainability. This translates in housing development to be ‘cultural and social household requirements, affordability for initial and ongoing costs with reduction in climate change contributing factors such as greenhouse gas emissions, resource intensive building inputs, etc. 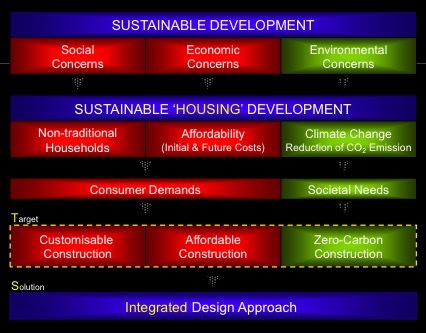 Consumer demands and societal needs will impact the development of sustainable housing to create customisable construction to suit occupant needs, affordable construction of zero carbon construction and housing. This can only be achieved through an integrated design approach that looks at all levels of the building life cycle. Consumers will demand affordable customisation. They are no longer satisfied with generic, monotonous products; rather, they prefer to purchase customised products. Producers will require a marketable and reproducible green home. Semi-custom homes with moderate standardisation and customisation. Mass Custom Home as separate from a ‘ready built-home, semi-custom home and a home. Society will demand ecological responsible design and green products. Context of sustainability and sustainability models has been previously explained. Similarly, sustainable construction has also evolved. 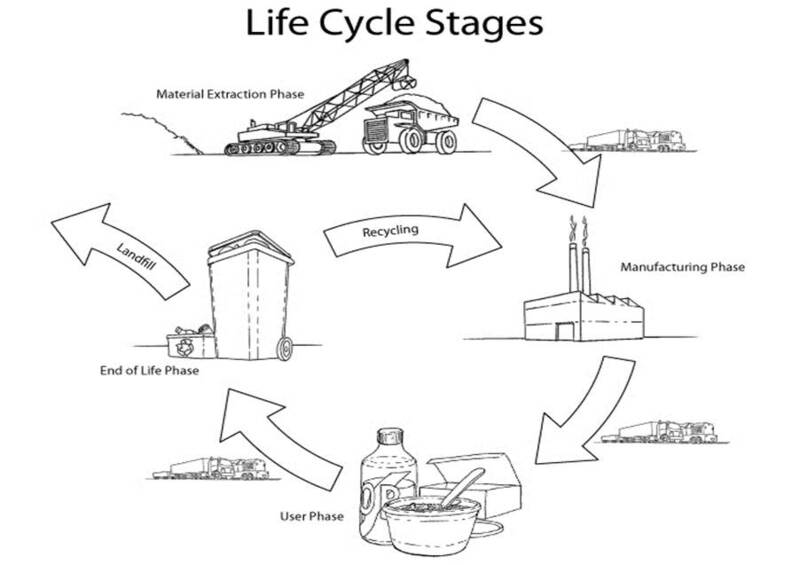 Activities included in a building’s life cycle include: raw materials, transport, construction, banking, insurance, communications, marketing, etc. Sustainable construction requires the review of the greenhouse gas emissions throughout the production of buildings. greenhouse gas emissions are present as embodied energy, in transport, operationally and in the disposal of related waste. Embodied energy is present in all the stages, both direct and indirect. Treloar (1997) defined embodied energy as ‘the resources (energy, water, raw materials) required by all the activities associated with a production process and the share of resources used in making equipment and other supporting functions (direct and indirect)’. Embodied energy of an average house = 15 GJ/m2 * 240 m2 = 3600 GJ. The earth’s circumference is 40,075 km so this would equate to travelling almost 35 times around the world. This entry was posted in Climate change, Efficient Buildings and tagged embodied energy, global context model, green buildings, life cycle of a building, sustainable building construction, sustainable buildings. Bookmark the permalink.